There is something beautiful about old ships and the sheer mechanical ingenuity to keep them working. In the U.S. Navy, the average ship lifespan is currently 18.2 years, with 36 years being the generally accepted maximum service life, although some ships will sail longer. Globally, the average commercial ship is 11 years old. The oldest active U.S. Navy warship, the command ship USS Blue Ridge, was commissioned in 1970. Brazil commissioned the 720-ton, 180-foot-long Parnaiba into service in 1938. She first launched in 1937, which makes her more than 81 years old. An armed river monitor, she is often cited as one of the oldest active warships in the world — not including certain historic vessels such as the USS Constitution, which serves as heritage and museum ship. In terms of operational and active ships doing military work, perhaps only the Russian salvage ship Kommuna is older, having first launched during the reign of Tsar Nicholas II as the Volkhov in the grand old year of 1913. Parnaiba is still patrolling Brazilian rivers with a crew of 74 — although those crew are now servicing diesel engines instead of the original steam turbines, which were removed in the 1990s and put on display in a museum in Mato Grosso do Sul, which borders Paraguay and Bolivia. Unlike the Kommuna, the Parnaiba carries weapons, which means she may be the oldest active armed ship. A year before, Brazil swapped out her two Bofors 40/60 cannon for larger Bofos 40/70 cannons taken from the Niteroi-class frigate Liberal — and added a flight deck which services an IH6B Bell scout helicopter. Parnaiba‘s main weapon is a forward-mounted 76-millimeter cannon. She has wartime experience — a brief one. In 1942, Brazil declared war on the Axis following the sinking of Brazilian merchant vessels by German U-boats. Parnaiba wasn’t fit for sub-hunting duties, however, she escorted the battleship USS Iowa during one the latter’s voyages in the Atlantic before the big-gun American warship deployed to the Pacific. 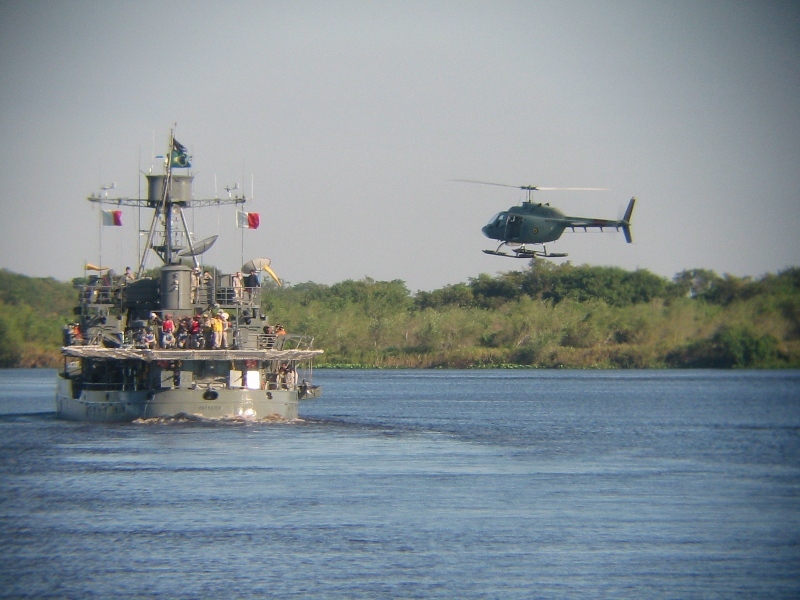 In the decades since, Parnaiba has patrolled rivers, trained with other navies in South America and delivered medical supplies to rural areas — along with hosting the occasional tactical demonstration, seen above, set to the song Tropa de Elite by the punk band Tihuana blasting from an on-board sound system. The song is most famous for its part in the 2007 film of the same name about Rio de Janeiro’s Special Police Operations Battalion, a commando unit which hunts drug traffickers while wearing black uniforms bearing a death’s head logo. The choice of music is relevant. In 2011, Parnaiba participated in patrols in southwestern Brazil searching for clandestine moorings and landing strips used by cartels. She’s a creaky, ancient ship — but she still has a job to do.